Nancy Miodrag’s research interests are in understanding the health disparities of parents and their children with Autism Spectrum Disorders and other intellectual disabilities. Specifically, she studies psychological stress, health, and mental health of parents as well as children’s behavioral phenotypes. She is equally interested in using psycho-educational techniques such as mindfulness-based interventions to reduce stressors and promote adaptive coping among these families. The Human Development program provided me with a strong theoretical foundation in typical and atypical development through core courses such as Developmental Psychopathology and Cognitive and Social Development. The program equally prepared me for applied work with families and children with disabilities through an internship at the Montreal Children’s hospital (Autism Spectrum Disorders program) and through data collection under the National Early Intervention project directed by Dr. Ingrid Sladezcek. Most notably, I had exceptional opportunities to develop critical research skills that helped me to secure doctoral funding and a post-doctoral research fellowship upon graduation. The Human Development program provided both breadth and depth in understanding the developmental trajectories of children and their families. I am grateful to the department and committed faculty members for providing me with such an enriching experience. Dr. Jessica R. Toste is an assistant professor in the Department of Special Education at The University of Texas at Austin and a fellow of the Reading Institute within The Meadows Center for Preventing Education Risk. She received her PhD in educational psychology from McGill University (Montreal) in 2011. Her research interests are related to students with learning disabilities and effective reading interventions, with a particular focus on psychosocial processes and classroom climate as determinants of school success. She has published articles and book chapters on resilience factors related to achievement and psychosocial functioning of youth at-risk. Toste was trained in reading intervention research as a postdoctoral fellow at Vanderbilt University (2011-2013) and as a Fulbright scholar/visiting researcher at the Florida Center for Reading Research (2008-2009). She was the recipient of the Canadian Education Association’s 2012 Pat Clifford Award for Early Career Research in Education. She is also a licensed elementary school teacher in Quebec and has extensive experience as a reading specialist. The Human Development program provided me with essential training in development across typical and atypical trajectories. The focus on understanding diversity in development informed my own program of research and my interest in exploring variations in educational effectiveness for students with reading disabilities. Further, the program supported my own growth as a researcher who conducts both basic and applied research. The mentorship I received was essential to my training in theoretical foundations, research methodology, and advanced statistical analyses. Dr. Carlos Gomez-Garibello is an assistant professor in the Department of Medicine, and a Core Member of the Centre of Medical Education. He earned his doctoral degree in Educational Psychology at McGill University. His areas of interest include assessment and evaluation methods at the postgraduate level. 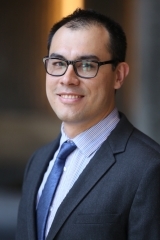 Specifically, Carlos is interested in the development and implementation of workplace–based assessment initiatives, and the study of entrustment of learners in clinical settings. He has experience in the design of quantitative educational research and in the analysis and interpretation of statistical and psychometric techniques. He is currently the assessment and evaluation lead in Postgraduate Medical Education at McGill University. My educational experience in the Human Development program shaped my interest in creating innovative and applicable research projects in educational contexts. The program’s emphasis on cognitive, social and emotional development throughout the lifespan definitely influenced my perspective on education and assessment. The courses and seminars challenged me, and provided me with both theoretical frameworks and research methodologies that I am currently using in my service and scholarly activities. The educational approach employed in courses and seminars encourage students to develop critical thinking and collaborative work abilities among many other competencies that are key elements of lifetime learning. The program offers several opportunities to engage in academic and non-academic activities that have been determinant in the formation of my own professional identity. Rather than academic supervision, faculty in the department offer mentorship to graduate students. They are truly committed to helping students to thrive, both academically and personally. Maria Di Stasio is a postdoctoral fellow in the Department of Educational Psychology at University of Alberta. She completed her PhD in Educational Psychology in the Human Development Program. Her research interests include social emotional development, relational problems including bullying in schools, and ecological factors that influence social and academic outcomes. Maria has also conducted research on inclusive education, teaching practices and early literacy development. She has an interest in quantitative research designs and statistical methods used in educational contexts. The Human Development Program impacted my interest in developmental research and assessment. I developed a strong theoretical basis in typical and atypical development and learned about the cognitive, social and emotional aspects that influence behavior throughout a lifespan. Courses and seminars offered in the program are designed with opportunities for collaboration and cooperation which helped structure and support my learning. I developed skills in research methodology and advanced statistical methods that I am now able to apply in educational contexts. This training allows me to conduct research using the most innovative strategies and techniques. The diversity in areas of research pursued by members of the faculty, their expertise and the mentorship provided within the department was instrumental in attaining my academic and professional goals. Jump back to main Human Development program page.